What capability areas merit highest priority for modernizing U.S. forces to meet emerging challenges? How much would it cost to develop and deploy capabilities and posture enhancements called for by the emerging security environment? This report evaluates the capabilities of current and programmed U.S. forces to meet the demands of conflicts that could arise involving any of five potential adversaries: China, Russia, North Korea, Iran, and Salafist-jihadi groups worldwide. The report finds that U.S. forces today are larger than necessary to fight a single major war, are failing to keep pace with the modernizing forces of great power adversaries, are poorly postured to meet key challenges in Europe and East Asia, and are insufficiently trained and ready to get the most operational utility from many of its active component units. The report recommends a host of enhancements to the capabilities and posture of U.S. forces and offers three alternative force planning constructs to help ensure that defense resources are, in the future, applied to the highest-priority needs. The U.S. Department of Defense (DoD) continues to use a Two Regional Wars standard for force planning, although this standard now bears little relationship to what the administration and the nation expect U.S. armed forces to be prepared to do. Important national interests today are being challenged by two major powers — Russia and China — that pose operational and strategic challenges that far outstrip those posed by the regional adversaries that animate DoD's current force planning construct (FPC). With its growing arsenal of nuclear weapons and ballistic missiles, North Korea today presents threats for which U.S. and allied forces lack satisfactory answers. Although the United States and its allies and partners have made considerable headway in blunting the threat posed by al Qa'ida and its affiliates, U.S. forces must expect to be engaged in the struggle with Salafist-jihadi groups, such as ISIS, for many years to come. Addressing the challenges posed by the most-capable adversaries generally calls not for a larger U.S. force but rather for a force equipped with appropriate modern weapons and support assets that is also postured for responsive and resilient operations in theaters of potential conflict. Force planning in DoD today should place greater priority on modernizing the capabilities and posture of U.S. forces in order to better enable them to deter and defeat aggression by China, Russia, and North Korea. At the same time, force planners should provide for the continued, gradual expansion of special operations forces, modernize U.S. nuclear forces, and raise readiness levels of active component forces. Systems and concepts to permit U.S. forces to detect, locate, and damage or destroy mobile military forces (e.g., naval vessels, mechanized ground forces) in areas protected by advanced air defenses. Systems and concepts to permit the rapid suppression/neutralization of advanced air defense arrays. New approaches to increase the resiliency of forward land and sea bases so that they can sustain operations in the face of repeated attacks by precision cruise and ballistic missiles. Systems and concepts to increase the resiliency of key capabilities based in space, including positioning, timing, and navigation (PNT); reconnaissance; and communications. Prepositioning and forward stationing of assets in theaters to offset existing imbalances and to support more rapid, large-scale operations. Implementing these recommendations at today's level of defense spending would necessitate substantial reductions in force structure. The nation could avoid major force cuts and achieve the objectives outlined above by increasing defense spending by $20 billion to $40 billion per year on a sustained basis. This project is a RAND Venture. Funding was provided by gifts from RAND supporters and income from operations. The research was conducted within the International Security and Defense Policy Center of the RAND National Defense Research Institute. 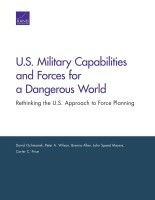 Ochmanek, David, Peter A. Wilson, Brenna Allen, John Speed Meyers, and Carter C. Price, U.S. Military Capabilities and Forces for a Dangerous World: Rethinking the U.S. Approach to Force Planning. Santa Monica, CA: RAND Corporation, 2017. https://www.rand.org/pubs/research_reports/RR1782-1.html. Also available in print form.